The electronic edition is a part of the UNC-Chapel Hill digitization project, Documenting the American South. PRINTED AT THE OFFICE OF THE RALEIGH REGISTER. ACTS OF THE GENERAL ASSEMBLY. AN ACT TO CONSOLIDATE INTO ONE, THE SEVERAL ACTS OF THE GENERAL ASSEMBLY OF THIS STATE RELATIVE TO THE APPOINTMENT OF TRUSTEES OF THE UNIVERSITY, FOR THE GOVERNMENT THEREOF, AND FOR OTHER PURPOSES. Be it enacted, &c. That John Haywood, Benjamin Smith, William Polk, Henry Potter, Archibald D. Murphey, Duncan Cameron, Joseph Caldwell, Thomas Winns, Edward Jones, James Webb, Henry Seawell, Calvin Jones, John D. Hawkins, Robert H. Jones, Jeremiah Slade, Joseph H. Bryan, Robert Williams, William Gaston, Thomas Brown, Francis Locke, Montfort Stokes, Thomas Love, Archibald McBride, Atlas Jones, Lewis Williams, William M'Pheeters, Frederick Nash, Thomas Ruffin, James W. Clark, John Stanly, Bartlett Yancy, Leonard Henderson, John Branch, William Miller, Simmons J. Baker, George E. Badger, Kemp Plummer, Thomas Bennehan, Willie P. Mangum, James Mebane, John Witherspoon, John B. Baker, James Iredell, William Martin, Joseph B. Skinner, James C. Johnston, Enoch Sawyer, Alfred Moore, John D. Toomer, John Owen, Gabriel Holmes, Romulus M. Saunders, Lewis D. Schweinitz and Thomas P. Devereux, are hereby declared to be Trustees of the University of this State, and the successors of the Trustees appointed by an Act of the General Assembly of this State, passed in the year one thousand seven hundred and eighty-nine, entitled "An Act to establish a University in this State," and that the appointment of the Trustees aforesaid is hereby confirmed, and they are declared to have all the power and authority heretofore conferred by law on the Trustees of the said Institution. 2. Be it enacted, That the Board of Trustees of the University shall consist of sixty-five members, all of whom shall be resident citizens of this State. 3. Be it enacted, That the additional number of Trustees hereby authorized shall be elected by joint ballot of both Houses of the General Assembly; and that, hereafter, when any vacancy or vacancies shall happen in the said Board, by death, resignation, refusal to act, removal out of this State or other cause, it shall be the duty of the President of the Board to communicate, or cause to be communicated by the Secretary, to the General Assembly, the said vacancy or vacancies, and thereupon, they shall elect, by joint ballot of both Houses, a suitable person or persons to fill the same. 4. Be it enacted, That the Board of Trustees shall have power to vacate the appointment and remove a Trustee for improper conduct, stating the cause of such removal on their journal: Provided, the same shall be done at an annual meeting of the Board, and that there shall be present at the doing thereof at least twenty of the members of the Board. 5. Be it enacted, That the Governor of this State for the time being shall be, and he is hereby declared to be President of the Board of Trustees of the University, and as such, shall preside at all the meetings of said Board at which he may be present; and if, by indisposition or other cause, the Governor shall be absent from any meeting of the Board, he may appoint, in writing, some other person, being a Trustee, to act as President for the time being, and who shall preside accordingly: and if, at any time, the Governor shall be absent at the meeting of the Board, and shall not have appointed, as aforesaid, a President, it shall be lawful for the Board to appoint a President for the time being, who shall preside as such. 6. 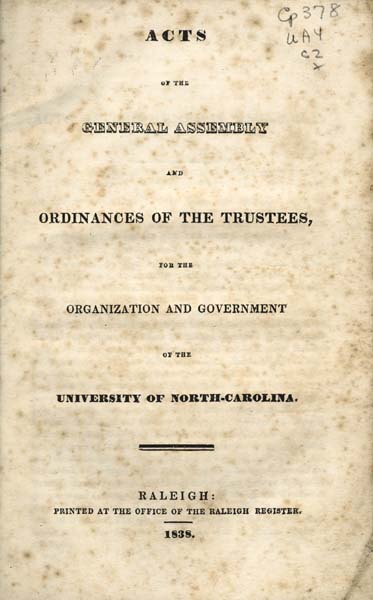 Be it enacted, That there shall be an annual meeting of the Board of Trustees during the Session of the General Assembly, in the City of Raleigh, and at such time and place as the President of the Board may appoint; and at any of the annual meetings of the Board, any number of Trustees, not less than seven, shall constitute a quorum, and be competent to exercise full power and authority to do the business of the Board; and the said Board, or the President thereof, shall have power to appoint special meetings of the Trustees at such time and place as in their opinion the interest of the Institution may require; but no special meeting shall have power to revoke or alter any order, resolution or vote of an annual meeting. at which time the said Board shall elect a proper person to fill the said vacancy. 8. Be it enacted, That the second section of an Act passed in the year one thousand eight hundred and five, entitled "An Act appointing the Governor for the time being President of the Board of Trustees of the University," and that so much of the several Acts of the General Assembly of this State, as is inconsistent with this Act, be, and the same is here-by repealed; and that this Act shall be in force from and after the ratification thereof. AN ACT TO AMEND AN ACT, PASSED IN THE YEAR EIGHTEEN HUNDRED AND TWENTY-ONE, ENTITLED "AN ACT TO CONSOLIDATE INTO ONE, THE SEVERAL ACTS OF THE GENERAL ASSEMBLY OF THIS STATE, RELATIVE TO THE APPOINTMENT OF TRUSTEES OF THE UNIVERSITY, FOR THE GOVERNMENT THEREOF, AND FOR OTHER PURPOSES." Be it enacted, &c., That the Board of Trustees, at their annual meeting, may, by resolution, vote or ordinance, from time to time, as to them shall seem meet, limit, control and restrain the business to be transacted, and the power to be possessed and exercised by special meetings of the Board, called according to the sixth section of the above recited act; and the powers of such special meetings shall be limited, controlled and restrained accordingly. And every order, vote, resolution, or other acts done, made or adopted by any special meeting, contrary to any order, resolution, vote or ordinance of the Board, at an annual meeting, shall be absolutely, to all intents and purposes, null and void. AN ACT CONCERNING THE UNIVERSITY OF N. CAROLINA. and if any contract for the sale of such articles shall be made, it is hereby declared to be null and void, and no recovery shall be had thereon. 2. No license shall be granted to retail spirituous liquors at Chapel-Hill, or within two miles thereof; any license obtained for that purpose shall be null and void, nor shall it be lawful for any person to give an electioneering treat or entertainment within two miles of the University of the State. 3. It shall not be lawful for any person or persons to exhibit any theatrical, sleight of hand, or equestrian performances, dramatic recitations, rope or wire dancing, or natural or artificial curiosities, at Chapel-Hill, or within five miles thereof, without the special permission, in writing, of the Faculty. 4. No person shall set up or keep up any billiard table, or other public table, constructed or erected for playing games of chance, by whatever name called. 5. If any person or persons shall offend against the provisions of this Act, or any of them, he, she or they, thus offending, shall be liable to be indicted under this Act, and fined or imprisoned at the discretion of the Court, or under any general Act or Acts of the General Assembly, prohibiting said offences. Be it ordained, That a Committee of seven members of this Board (of whom the President shall, ex officio, be one) shall be appointed at every regular annual meeting of the Board, to be called "the Executive Committee of the Trustees of the University of North-Carolina," a majority of whom shall form a quorum for transacting business: that all the duties heretofore assigned to, and powers vested in the Land Committee, the Committee of Appointments, and the Building Committee, be, and they are hereby assigned to, and vested in the Executive Committee hereby provided for. The Secretary of the Board of Trustees shall be Secretary of the Executive Committee; he shall attend their meetings, and enter their proceedings in a regular Journal, to be kept for that purpose. The Executive Committee shall have power to make such contracts for the sale of the property and effects, both real and personal, of the University, as they may deem best for the interest of the same. The Executive Committee shall have power to alter, change and regulate the course of studies and discipline prescribed at the University, and to dismiss any Professor or Tutor for such cause as they may deem sufficient. All the Acts of the Executive Committee, under the authority of this Ordinance, shall be fully stated in the Journal of this Committee, and shall be laid before the Trustees at the next regular annual meeting of the Board. All former Ordinances and Resolutions of the Board of Trustees, appointing a Committee of Appointments, a Land Committee and a Building Committee, are hereby repealed. The Executive Committee to be appointed under this Ordinance, shall have power to fill all vacancies happening in their own body. The Faculty of the University of North-Carolina shall be composed of the President, Professors, and Tutors; a majority of whom being assembled, after due notice given by the President, or presiding Professor, to all the members, shall be competent to the transaction of business. 2. Every matter brought before the Faculty, shall be decided by votes, and it shall be the additional privilege of the President, or presiding Professor, to give a casting vote, when otherwise there would be a tie. 3. The Professors shall take rank according to the dates of their appointment. 4. The President may convoke the Faculty at his discretion, and the Faculty may also meet by adjournment. 5. The opinion or vote of any member of the Faculty, shall not be made known directly or indirectly to any one who is not a member of the body, except when express order shall be given to that effect by a unanimous decision of the Faculty. 6. A member of the Faculty shall not be a sitting member of any Society of Students. 7. It shall be the duty of every member of the Faculty individually, to be vigilant in carrying into effect every law of the College: and to report to the President or to the Faculty, such transgressions as ought to be punished by that body. transactions in a book kept for that purpose. This record shall be laid before the Board of Trustees, when required by them. 9. No act of the Faculty, which is not recorded by their order, shall be considered valid. 10. It shall be the duty of the Tutors to reside in the buildings of the University, to maintain order and decorum among the students, and to assist under the direction of the President and Professors, in the instruction of the classes. 11. The Professors and Tutors shall, in succession, examine the rooms of the College, at least once a week, and see that cleanliness and neatness be preserved. In these visitations, they shall take an account of the locks, doors, windows and furniture, with the names of the inhabitants in each room. When damage of any description in the College buildings is at any time observed by a member of the Faculty, it shall be his duty to report it as soon afterwards as possible to the Bursar, that it may be immediately repaired. 12. It shall be the duty of each member of the Faculty, when he is to hear a class recite, to go to the Recitation Room, and take possession of it a reasonable time before the hour for the bell to ring, to prevent assemblages of Students before the proper time, and to see that the Recitation Room is in a proper condition for the reception of the class. The recitation of the class shall continue through the hour, or at least until the bell shall give notice of its expiration. 13. Every Professor shall have a room appropriated to him in the College. It is expected of the Professors, as pertinent to their office, to pass as much of their time every day in these rooms, as they conveniently can, to aid in the order and instruction of the College. The Board of Trustees will also look to the Professors to visit in succession the rooms of the Students at night, as often as convenient. 14. The Faculty of the University, that is the President and Professors, by and with the consent of the Trustees, shall have the power of conferring all such degrees or marks of literary distinction as are usually conferred in Colleges or Universities. 15. Immediately after every annual Commencement, the Faculty shall cause to be transmitted to the Secretary of the Board of Trustees, a certificate signed by the Clerk of the Faculty, containing a specification of the persons graduated, and of the degrees respectively conferred upon them. Of admission into the University. 1. To take regular standing as a Student in the University, a candidate must sustain an approved examination before the Faculty, on such parts of the plan of education as have been already prosecuted by the class into which he would enter. 2. To become a Student on partial or irregular standing, the candidate, if he be not twenty-one years of age, must exhibit a certificate from his parent or guardian, that he is permitted to enter on such terms. If he would prosecute any branch of science, into which a class is already advanced, he must be examined with approbation on such parts of the science as the class has already completed. 3. 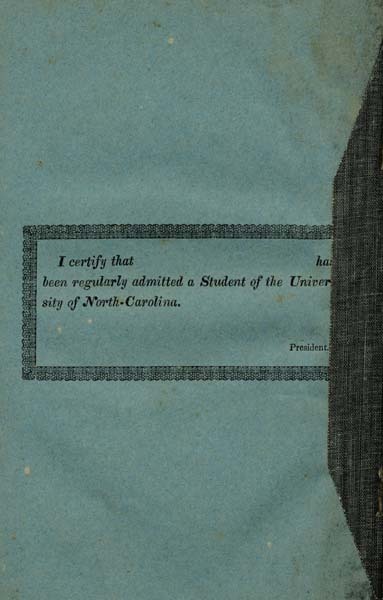 Every Student, at his admission, shall obtain a copy of the Laws from the Bursar, and a certificate with the name of the President or presiding Professor, signed by himself, of the Student's regular admission into the University; and these shall be at all times, a necessary testimony of his being a Student, to be shown when called for, to any member of the Faculty. 4. Every person, on admission into the University, shall pay the College dues for the session in advance. 5. If a Student shall enter before the session shall be half elapsed, he shall pay for the whole session; if he shall arrive at the middle of the session, or after it, he shall pay for half the session only; but room rent shall always be paid for the whole session. 6. If any person whose object it is to become a Student, shall fail to report himself to the President, on the first day after his arrival, he shall be excluded, if his reasons for delay be deemed invalid by the Faculty. 7. Any native of the State, desirous of prosecuting his studies in the University, who shall furnish satisfactory evidence of good talents, studious habits and exemplary morals, and who shall be unable to defray the expense of tuition, may, at the discretion of the Faculty, be admitted to all the recitations of the Classes, free from any demand for tuition. Such beneficiaries may occupy the rooms of the College, free of rent, when the rooms are not necessary for the accommodation of such Students as pay tuition and room rent. 8. The Faculty shall be authorised, in all cases, when, from examination, reasonable hopes can be entertained that deficiencies can be made up, to admit applicants for a single session, to whom regular standing shall be awarded at the end of that time, if the individual shall, upon examination, be found entitled to it. 9. An applicant shall not ordinarily be admitted into the University under the age of sixteen; but any applicant exhibiting in the opinion of the Faculty, the requisite strength and maturity of physical and mental constitution, and ample acquirements, and producing satisfactory testimonials of established moral character and steady habits, may be admitted, in the sound discretion of the Faculty, though he may not have attained this age. One of the Professors shall be appointed Bursar of the University. It shall be his duty to receive from the Students the money or drafts for money they may bring with them, and disburse the same in paying the Board, Tuition fees, College dues, and other necessary expenses of the Students. He shall keep an account of the money received of, or for, and disbursed, for each Student, and at the close of each session, he shall render a copy of such account to the Parent or Guardian of each Student, and pay the balance (if any there be) to such Parent or Guardian, or to his or her written order. 2. Each Student, on his arrival at the University, shall pay over to the Bursar all money, or drafts for money, which may be committed to him for the payment of College expenses; and for his so doing, shall be considered as acting under a pledge of honor. 3. The Bursar shall be allowed five dollars for receiving and disbursing the money of each Student, which shall be paid at the close of each session, by the Treasurer of the University. 4. No Student of the University shall, during the session of College, under any pretence, contract any debt whatsoever; and if any Student violate this Ordinance, or if the Parent or Guardian of any such Student, or any other person in his or her behalf, shall pay or satisfy any debt so contracted by any such Student, such Student shall be forthwith dismissed from the University. 1. The business of the University shall commence without delay, on the first day of the session. prayers shall be at sunrise. From the first of September to the first of May, the hours of study in the forenoon shall be from 9 till 12, and from 2 till 5 in the afternoon; and the bell shall be rung for summoning the Students to their rooms at 8 o'clock in the evening. Through the other part of the year, the hours of study in the forenoon shall be from half past 8 till 12, and from 3 till 6 in the afternoon; and the bell shall be rung in the evening at 9 o'clock. 3. Every student shall regularly and punctually attend the recitation of his class at the place appointed by his instructer, and at the ringing of the bell to give him notice. He is not to be at the door of the recitation room, nor within it, nor loitering about the doors or passages of the buildings, before such notice is given. His Professor or Tutor shall call him to account for absence or delay, or neglect of preparation on the subjects assigned, and shall be the judge of his excuse. If a good reason be not shown for the delinquency, he may be cited before the Faculty to answer for it. 4. In the computation of absences from prayers and recitations, two tardinesses will be considered and marked as one absence, and retiring from the Recitation room during the progress of recitation will also be considered equivalent to an absence, and reported accordingly. 5. Whenever the absences of a student other than those occasioned by sickness or consequent upon permission either from prayers or recitation, shall exceed in any one month one fourth the whole number which such student was bound to attend, the fact shall be reported to his parent or guardian, with a request that he be forthwith withdrawn from the Institution, or he shall be dismissed, at the discretion of the Faculty. 6. Every student shall observe a strict propriety of conduct at recitation or lecture; refraining from every thing which shall interrupt business, or divert the attention of others; he shall not recline or lounge upon the benches, nor be employed in reading newspapers, nor any book or paper whatever, except such as the Professor or Tutor at the time shall direct. It is the duty of the student to attend exclusively to the subjects of lecture or recitation, as they proceed with a view to his own improvement and to that of the class. For gross or persevering violations of these rules of decorum, he may be forthwith dismissed from the room, when his instructer shall deem it necessary. it, except for natural impediments, or other disqualifications, of which the Faculty may judge. The members of the Senior Class shall be excused from these exercises, and instead of them, shall pronounce at stated times, during each session, two orations of their own composition, one of which shall be at the commencement. 8. Should any student be absent from examination, he may be summoned before the Faculty to show the reasons of such absence, and he shall be examined publicly by the Faculty, before he shall be permitted to join his class. 9. No student shall absent himself from the University during the session, without permission first obtained from the President, or in his absence from the presiding Professor. But leave of absence from recitation may be granted to a student by his Professor or Tutor. 10. If any student shall be habitually indolent or inattentive to business, or absent from prayers, recitation or public worship, or at any other time when it shall be his duty to attend, he shall be subject to penalty according to the aggravation of his delinquency. 11. If a student at an examination be found deficient, he may be publicly mentioned as a bad scholar by the Faculty or Trustees, admonished to greater diligence, or put into such class as shall suit his standing. 12. On the day of commencement, the candidates for degrees, shall perform such exercises as shall be appointed them, and no candidate shall decline the exercise assigned him, under penalty of being refused his diploma. 13. Every person obtaining a diploma, shall pay to the President of the University, for the degree of Bachelor of Arts four dollars, and for the degree of Master of Arts, five. 14. Nothing indecent, profane or immoral, shall at any time be delivered on the public stage, under such penalty as the Faculty or Trustees shall think necessary. And with a view to preserve all public exercises of the students from impropriety of any kind, every student, during the whole of his senior year, and previously to his commencement performances, especially, shall show to the President or presiding Professor, or to some officer designated by him, the whole of what he proposes to speak, and shall not fail to observe such corrections as shall be made, and if any student pronounce any thing in public of a censurable nature, in contradiction to the directions or corrections of the officer to whom he has shown his piece, the President or presiding Professor may stop him on the public stage, and he shall be otherwise censured as the Trustees or Faculty shall determine. 15. If any student shall cut, or injure the buildings or furniture of the College, or in any manner disfigure or deface them, especially with obscenity, profaneness or vulgarity, he shall beside making good the damage, be subject to such other punishment as may be judged necessary. 16. The degree of Bachelor of Arts shall not be conferred on any member of the College, until he shall have been a student at least one year; but the honorary degree of Bachelor of Arts, may be conferred agreeably to former custom. 17. When a student occupies a room at the beginning of a session, he shall continue in it until the end of the session, unless a change be permitted or directed by the Faculty. 18. A student shall not be permitted to make any alterations in the studies which he has undertaken to prosecute in any session, until the session shall expire. 19. There shall be no ball playing in or among the College buildings or against the walls. All athletic exercises must be kept at a distance, so as to prevent damage to the buildings and interruption to study. Of the Moral and Religious conduct of the Students, and their conduct towards the Faculty. 1. If any student shall deny the being of a God, or the divine authority of the Holy Scriptures, or shall assert, and endeavor to propagate among the students any principle subversive of the Christian religion, he shall be dismissed. 2. Every student, whether he live in College or in the village, shall attend public prayers morning and evening in the Chapel, and while attending shall refrain from all noise, conducting himself with such reverence and decorum as are suited to these sacred services. On Sunday it shall be the duty of every student to be present at the reading or delivery of a sermon in the Chapel, at the hour appointed by the Faculty for that purpose. No whispering, talking, reading, laughing or indecent behaviour of any kind shall be allowed on such occasions. 3. The students shall attend such instructions in morals or religion, as their Professors and Tutors, or the Faculty jointly shall appoint on Sunday. And if any student absent himself, or evade such instructions, he shall be punished by his instructer, or by the Faculty, according to his offence. 4. At all times the students shall deport and express themselves respectfully towards the Faculty, and every member of it. Any deficiency in this duty shall be considered as peculiarly in conflict with the laws and principles essential to a College, and shall be punished accordingly. 5. If a student making application for a privilege or immunity to one member of the Faculty, be refused, he shall not go to another member with the same request without informing him of the fact. His application however, may be renewed, if he shall think proper, to the Faculty as a body. 6. A Student shall not possess nor expose to another any book or picture that is impious or obscene. 7. No insulting language or treatment shall be offered by a Student or any number of students, to the people of the village, the country around the University, or of any other place. 8. If any Student or Students shall destroy or trespass on the property in the village or elsewhere, the authority of the College shall inflict an exemplary punishment on him or them, and any combination to prevent the execution of the civil law shall be severely punished. 9. A Student shall not go into the village on any account in the hours of study, without leave from some member of the Faculty. 10. No Student shall absent himself from the University, nor shall he attend any election without leave, unless it be to exercise the right of suffrage. 11. No Student shall make or attend horse races, nor bet upon them. They shall not keep fowls, nor in any manner participate in sporting with them. 12. A Student shall not engage in a game of hazard, nor shall he make any bet. 13. No Student shall keep a dog, or fire arms, or gunpowder. He shall not carry, keep, or own at the College, a sword, dirk, sword-cane, or any deadly weapon; nor shall he use fire arms without permission from the President. 14. No Student shall have spirituous or fermented liquors in his room, or even make use of them without permission from a Professor or Tutor. 15. A Student who shall be guilty of intoxication, shall be admonished, suspended, or dismissed, according to the nature and aggravation of his conduct. with persons of publicly bad character, under penalty of admonition, and if the practice be continued, of suspension or dismission. 17. If any clubs or combinations of the Students shall at any time take place, either for resisting the authority of the College, interfering in its government, showing disrespect to the Faculty, or to any of its members, or for concealing or executing any evil design, the Faculty are empowered and directed to break up all such combinations as soon as discovered, and to inflict a severer punishment on each individual than if the offence intended had been committed in his individual capacity, whatever be the number concerned, or whatever be the consequence to the College. 18. Written petitions for the removal of grievances, shall not be signed by more than three Students. 19. All profane and indecent language shall be utterly excluded from the University. The Student who is guilty of using such language, and on being warned, still perseveres, shall be admonished, suspended or dismissed, according to his offence. 20. Every Student who shall send to any person a challenge or message, either in writing or otherwise, purporting to be a challenge to fight a duel, shall be expelled. 21. Every Student who shall be the bearer of any challenge or message, in writing or otherwise, purporting to be a challenge, or in any wise relating thereto; or who shall, either directly or indirectly, have any agency therein, or in the duel that may be the consequence thereof, shall be expelled. 22. Any Student who shall accept a challenge to fight a duel, shall be expelled. 23. When a Student shall be expelled in consequence of the provisions of these Ordinances, he shall be delivered over to the civil authority, to be prosecuted as the law directs. 24. The Faculty of the University shall have full cognizance and jurisdiction of all offences under these laws against the atrocious act of duelling, and are hereby authorised and required to carry the same into full effect. 25. No Student shall associate or keep company with any person expelled from the University, on pain of such punishment as the Faculty shall think proper to inflict, consistently with the laws of the Institution; provided that such punishment shall not extend to expulsion. 26. On Sunday the Students shall refrain from their ordinary diversions and exercises. They shall not fish, hunt or swim, nor shall they walk far abroad, but shall observe a quiet and orderly behaviour. 27. If any Student shall use any indecent gesture or language to any other Student or person, he shall be liable to be admonished. 28. If any Student shall be convicted of lying, he shall be admonished, sus pended or dismissed, according to the degree of the offence. 29. If any Student, on being requested by any member of the Faculty to open the door of the chamber where he is, shall refuse or delay to comply, the door may be forced open and the Student compelled to make good the damage, and be otherwise punished as the Faculty shall judge proper. 30. If any Student shall be sent for by any member of the Faculty, and shall fail to come, he shall be held guilty of contempt of authority, and be punished accordingly. 31. The Students shall keep their rooms clean, and shall not put or procure to be introduced into the College, filth of any kind. Nor shall they throw on the outside of the College, against the walls, or around the buildings, any sort of dirt or rubbish, under such penalty as the offence may deserve. 32. No shouting, whistling, dancing, or any boisterous noise shall be permitted in the passages or rooms of the College at any time, upon such penalty as the nature of the offence may, in the judgment of the Faculty, properly incur. The Students shall not station themselves either singly, or in groups in the doors or passages, or any where among the buildings, especially in the hours of study; and at any time when it shall appear necessary to the order of the College, such assemblies may be broken up and dispersed by any member of the Faculty. 33. If a Student shall strike another Student in anger, or in any manner be guilty of a breach of the peace, it is a high offence, and shall be punished as such. 34. The absence of a Student from prayers, or from his room after the ringing of the bell, without leave in the evening, shall be registered by the Clerk of the Faculty. Once a week the absentees shall be regularly called to show their reasons of absence, and when the absences of a Student from prayers, from recitation, or from his room, especially in the evening, become frequent or numerous, he may be cited to answer for habitual delinquency, and such penalty be adopted as shall be judged necessary by the Faculty. 35. A Student who shall reside within two miles of the University in the vacation, shall be subject to the laws of the Institution in regard to moral conduct, so as to be responsible for violations of them, when he shall apply for admission in the ensuing session. 1. Private admonition by a member of the Faculty. 2. Admonition before the Faculty, by the President, or in his absence, by any one of their members whom the Faculty shall appoint. 3. Admonition before the class to which the Student belongs, by the President, or in his absence, by one of the members of the Faculty. 4. Public admonition before all the Students. This may be accompanied with a public confession of the fault, and a promise of reformation. 5. Suspension for a fixed time, not exceeding six months. This may be attended with admonition before the Trustees. 7. Expulsion; which punishment, except in cases of duelling, shall not be inflicted but with the sanction of five Trustees assembled. 8. When any Student shall be suspended, dismissed, or expelled, the President or presiding Professor shall address a letrer to the parent or guardian of such Student, informing him of the event and its cause. 9. Any Student who may be suspended or dismissed by the Faculty, shall not during his suspension, or during the remainder of the session in which he is dismissed, reside within two miles of the University, upon pain of a change of sentence by the Trustees into that of expulsion. To this, exception is admissible, when the parents of the Student live within the assigned limits. 10. When a Student shall so persist in habits of indolence and neglect of collegiate duties, or in disorderly behaviour, that there is no hope of reclaiming him to habits of industry and order, it shall be the duty of the President to address a letter to the parent or guardian of such Student, stating the circumstances and advising him to withdraw him from the Institution; provided nevertheless, that nothing herein contained shall be so construed as to prevent the Faculty from suspending any Student when the same shall appear necessary. but if the damage shall exceed the sum deposited, the author shall pay the excess. 2. A Student shall not live in the College buildings in the vacation, without permission expressly obtained from the Bursar, or in his absence, from some member of the Faculty. The officer is expected to register the name of the Student thus permitted to reside, who is considered as pledging himself to make good all damages which he may commit. For all damages done in the room which he occupies, he is responsible, whether he cause them personally or not; and he may be directed to relinquish his residence in the buildings at any time in the vacation. 3. The Students on leaving their rooms at the end of the session, or at any other time during the vacation, shall put the keys of their rooms into the hands of the Bursar. 4. It shall be the duty of the Bursar, at the beginning of every vacation, to have the doors and windows of the public buildings carefully fastened, where they are not inhabited. And if damages be done which he could not prevent, and of which the authors are unknown, he shall repair them at the expense of the Board. 5. It is recommended to the Students to be plain in their dress, but it is required of them always to appear neat and cleanly. If any Student be negligent in this respect, it shall be the duty of the College officers to admonish him for it, and if he persevere, to report him to the Faculty. 6. If a Student be present at the beginning of a session, he may claim the room occupied by him at the end of the preceding session; but if not, it may be inhabited by the first occupant. More than two persons may not live in one room at any time, without permission specially obtained. 7. No Student, without permission from the President or presiding Professor, shall go beyond the prescribed limits in study hours, or at any other time when the bell may call him to his duty. 8. A Student shall not receive visitors into his room, nor shall he visit others in the hours of study, without leave from a member of the Faculty. 9. No Student shall disturb or attempt any imposition on any of his fellow Students in any manner whatever; and every Student shall preserve order and decorum in his own room, and shall be responsible for all disorder committed in it, unless he give information, when in his power, of the person or persons from whom it proceeded. 10. The Faculty may interdict any house in the village as improper for the reception of Students as boarders, on account of the irregularities in which they are permitted or tempted to live, or the disorderly and pernicious examples set before them. 11. A Student may not occupy a room for residence out of College, till each of the rooms shall have two inmates. But Professors may receive Students to reside in their houses, and the Faculty may permit a Student to live in the village, when they shall judge his situation requires such indulgence. 12. At the ringing of the bell the first time in the morning, the Students shall rise to prepare for business. As soon as the bell shall ring a second time, they shall repair to the hall without delay, and attend prayers. Of the Librarian and Library. 1. No person but a Trustee or Member of the Faculty shall at any time have access to the Library, without the presence of the Librarian or some officer of the College. 2. The Senior Tutor shall be the Librarian, and at the end of every session, shall present to the Faculty a written report on the state of the Library. 3. Such books as, by a determination of the Faculty, ought not to be taken out by the Students, may be consulted by them in the Library, on such days, and within such hours, as shall be appointed by the Faculty. 4. A Student may not, at any time, take down a book from the shelves of the Library. The Librarian alone is to deliver it to him, and return it to its place. 5. When a Student shall take a book out of the Library, he shall sign a receipt, in which the book shall be specified by the Librarian. 6. A volume shall not be kept out of the Library more than one week, without being returned to the Librarian, and the receipt for it renewed. If any other person shall want the volume at the end of that time, the one who has already had it shall not then take it out anew. he may be admonished, suspended or dismissed, as the nature of the case may require. 8. The Librarian shall keep a catalogue of all the books of the Library. If any book shall be presented to the University, the name and residence of the donor shall be recorded. 9. The Librarian shall appoint a day and hour for delivering and receiving books, and shall attend once a week for these purposes. 10. While the Students are attending at the Library, they shall observe an orderly deportment. 11. A Student shall not lend a book which he has taken out of the Library, without permission from the Librarian. 12. It shall be the duty of each Professor and Tutor in the University, to keep a regular account of the scholarship of each Student during his course, noting his regularity and moral conduct, and at the end of each session, to furnish the parent or guardian of the Student with an abstract or account of the same, and cause this account to be laid before the Board of Trustees at the Public Anniversary Examinations. 1. The two Literary Societies having by former compact, agreed to apportion between them the College Buildings, and to make good the damages and dilapidations they may sustain, the following partition shall be recognized and respected, viz: the South ends of the East and West Buildings shall be occupied by the members of the Dialectic Society, and the North ends by those of the Philanthropic; the division of the South Building, as heretofore made by the Societies, shall be still maintained.